President Trump left Washington, D.C., Saturday morning for California after the death toll from the Camp Fire climbed to 71 and the number of people unaccounted for jumped to more than 1,000. Mr. Trump first visited Northern California, where the destructive Camp Fire is raging, then he traveled to Malibu, where the Woolsey Fire is 82 percent contained. Gov. 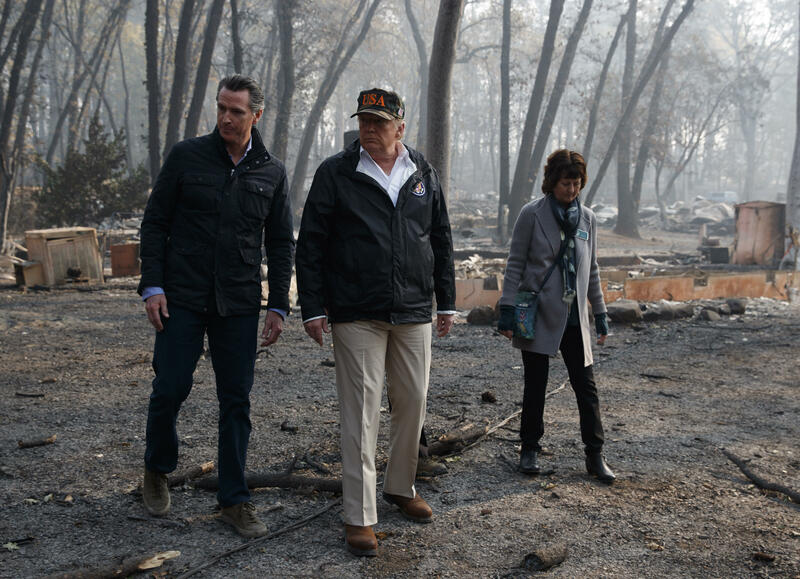 Jerry Brown and Gov.-elect Gavin Newsom, both Democrats, met Mr. Trump as he landed in California to tour the areas affected by the blaze. Mr. Trump toured destroyed homes in Paradise, joined by Paradise Mayor Jody Jones, FEMA administrator Brock Long, Brown and Newsom. Mr. Trump told reporters the federal government would provide "a lot of money and some expertise, and somehow we'll all pull through it together." "We do have to do management, maintenance, and we'll be working also with environmental groups," Mr. Trump said about how to prevent future fires. "Hopefully this is gonna be the last of these because this was a really, really bad one. And I know Gavin's committed, we're all committed." Later, in Chico, Mr. Trump declined to say whether climate change directly impacted the fires, saying there were "a lot of factors." He said that seeing the devastation had not changed his opinion on climate change. Both Brown and Newsom welcomed Mr. Trump's visit before he arrived, declaring it's time "to pull together for the people of California." Earlier this week, Mr. Trump threatened to cut off federal payments to California. "There is no reason for these massive, deadly and costly forest fires in California except that forest management is so poor. Billions of dollars are given each year, with so many lives lost, all because of gross mismanagement of the forests," Mr. Trump tweeted. "Remedy now, or no more Fed payments!" He later approved a federal disaster declaration. He also criticized forest management in an interview with Fox News' Chris Wallace on "Fox News Sunday," saying that while climate change "maybe contributes a bit," the "big problem we have is management." Mr. Trump reiterated those claims as he spoke to reporters on the White House lawn Saturday morning before departing for California. "We will be talking about forest management. I've been saying that for a long time. And it could have been a lot different situation," Mr. Trump said. Mr. Trump tweeted about his visit shortly before arriving on Saturday. He mentioned that he would be touring the state with House GOP Leader Kevin McCarthy and Republican Reps. Doug LaMalfa and Ken Calvert. The president incorrectly suggested that forest management in the state was largely controlled by the state's government, when it's the federal government that owns more than 60 percent of the land in the state. According to Climate Nexus, climate change amplifies the threat of wildfires by creating ideal settings for them to burn. Climate change is affecting conditions in both our summers and winters in ways that contribute to wildfires.